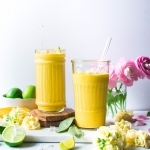 This mango coconut smoothie with turmeric and lime is not too sweet, but slightly floral and aromatic from the perfectly ripe mango, a bright clean layer of flavor from all that fresh lime juice that wakes up your taste buds, a little tropical creamy thing happening thanks to the coconut milk, and some anti-inflammatory love for your bod from the bold and vibrant turmeric. 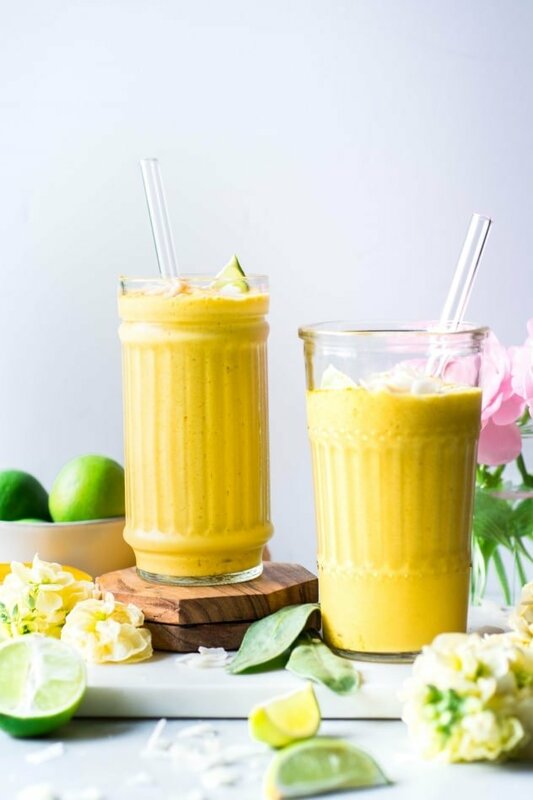 Even though the first day of fall is literally right around the corner, I’ll still start some of my mornings with healthy and vibrant smoothies. Especially when they’re loaded up with immune boosting good stuff like vitamin C, anti-inflammatory turmeric and the good-for-you fat of sweet and creamy coconut milk. The day I photographed this recipe I wasn’t even going to try and get a recipe in before coming home from work and making dinner. It would mean rushing home to try and catch the very last bit of daylight in a west facing window that’s not always very forgiving with the late afternoon sun, and putting dinner on hold for an hour or two. But then the cashier at my little natural grocer gifted me a beautiful bouquet of bright pink flowers, and the sky was just the right amount of cloudy to filter out the harsh sunlight that often streams through that window at 4 pm, and I knew I just had to do it. Sometimes the universe just speaks to you if you’re listen close enough. Nudge’s you in a certain direction – maybe away from the plans you’ve already made, but towards something equally (or maybe more) delightful and satisfying. So what’s inside this golden glass of yummy smoothie? 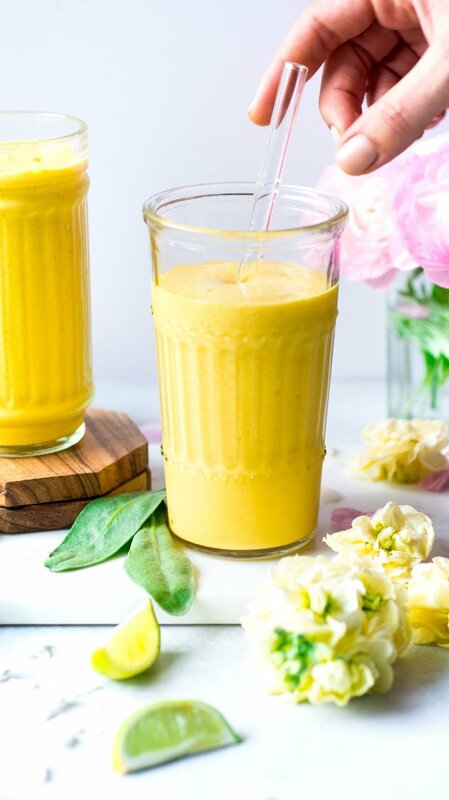 Well to start, there’s mango (obvi lol) – which brings most of the sweetness and body to this smoothie recipe. 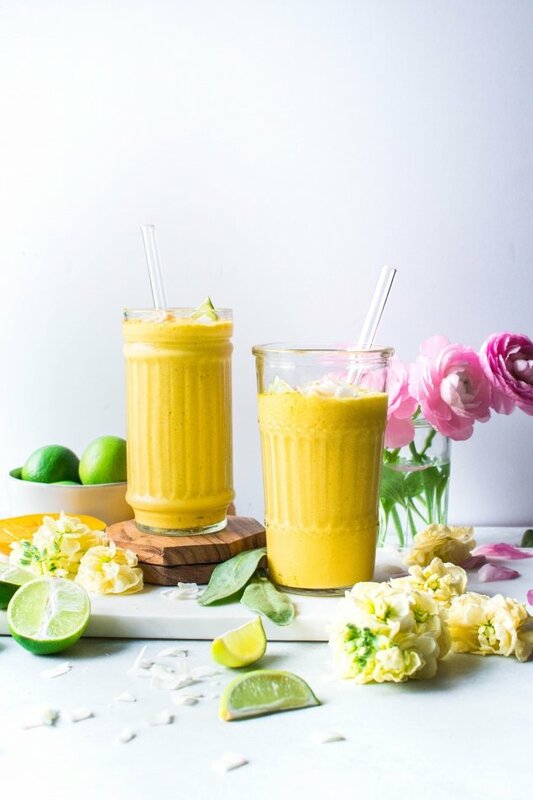 If you can find some super ripe + sweet mangoes at the grocery store I highly recommend cutting and freezing them to use here, as they’ll add a more complex, floral and honeyed note to the smoothie. This little tip all comes back to keeping food simple while using the best ingredients you can find. This will almost always bring you closer to the absolute best flavors and highest nutrition content. But if you’re greeted by hard, green, probably-won’t-ever-ripen mangoes at the grocery store do not despair. The pre-frozen mangoes from the freezer aisle of your grocery store will work just fine – and if they prove not to be sweet enough a little added honey will do the trick. Next there’s lots of lime juice. 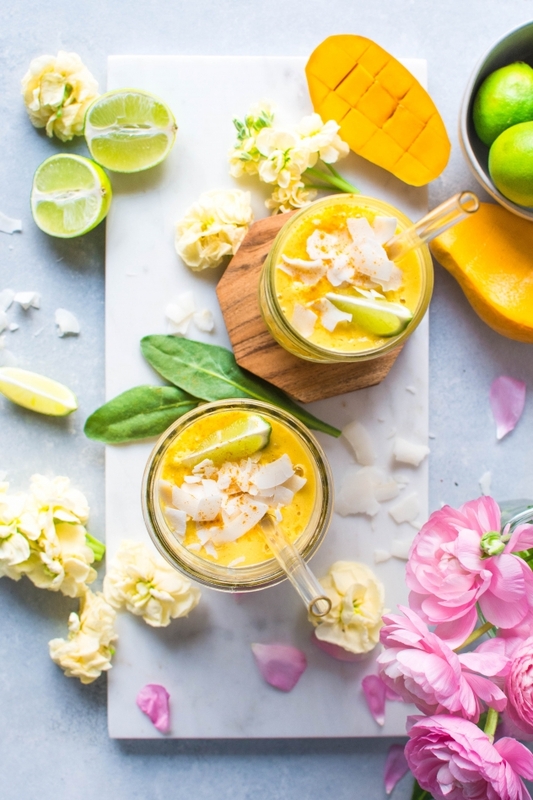 Like enough that this drink could almost pass as a tropical cocktail from your last beach vacation  The lime juice also packs a serious dose of vitamin C and brings a certain brightness that pairs perfectly with the honeyed sweetness of the mango. For the liquid component you’ll use part coconut milk and part water. 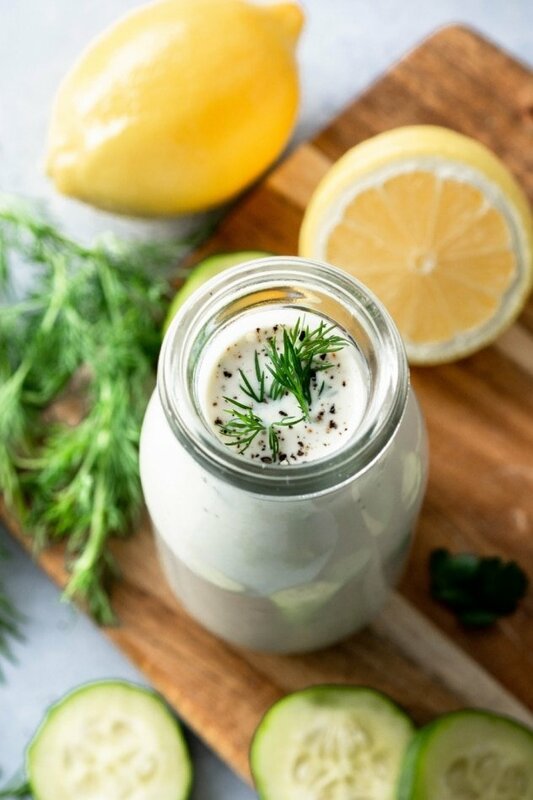 If you use only coconut milk the smoothie will end up a little too thick and creamy, but by mixing a bit of coconut milk and a bit of water you get just the right consistency. And now, we get to the good stuff. 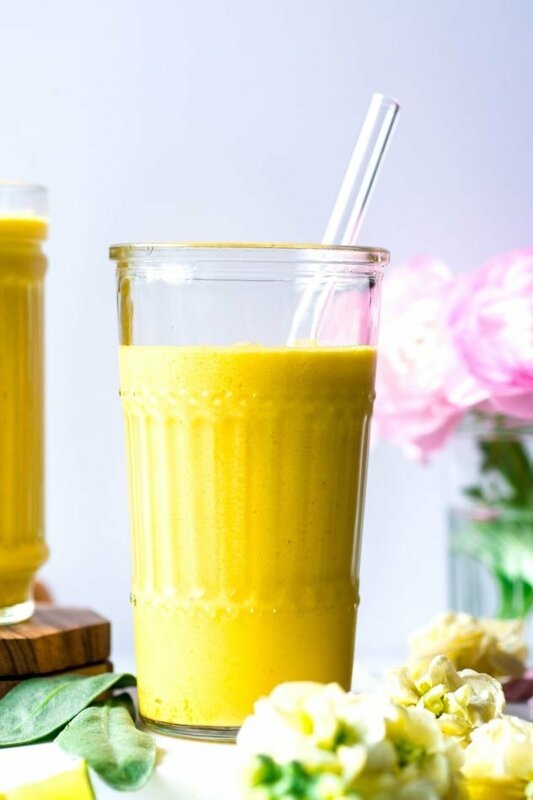 Some added turmeric is what really makes this smoothie go beyond the normal duties of a smoothie and bumps it up into the food-as-medicine category. 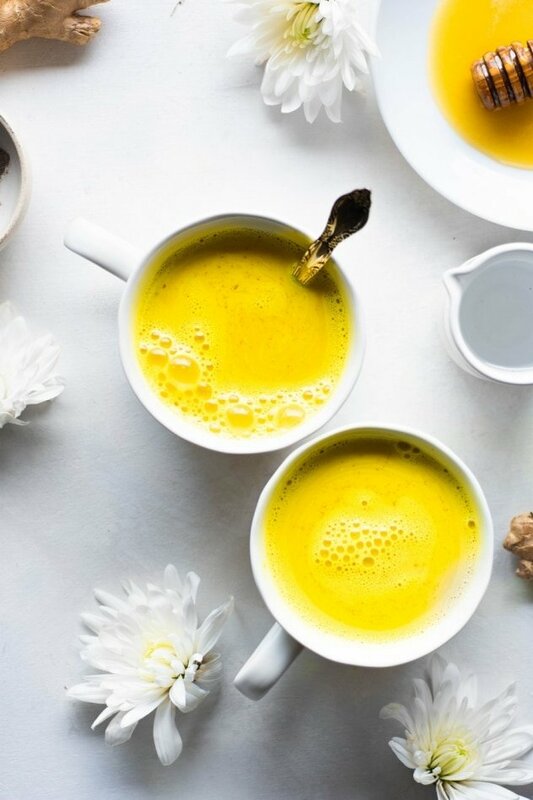 Turmeric is this amazingly bright-and-bold golden hued spice from the ginger family that originates in the Indian Subcontinent and Southeast Asia. Many studies have shown it’s potential for an anti-inflammatory effect on the body, and because of this it has gained quite a bit of notoriety lately. If you read ahead to the recipe you’ll notice that there’s also just a bit of black pepper in the recipe. This is because when turmeric is paired with black pepper it’s effects can be significantly greater. And even though it sounds out of place, I promise – it’s such a small amount you won’t even taste it. Mhmm! All of the ingredients in this smoothie make me and my body vv happy, and I think you’re gonna feel the same. The perfect balance of good and good for you that we all strive for. Let’s make some! 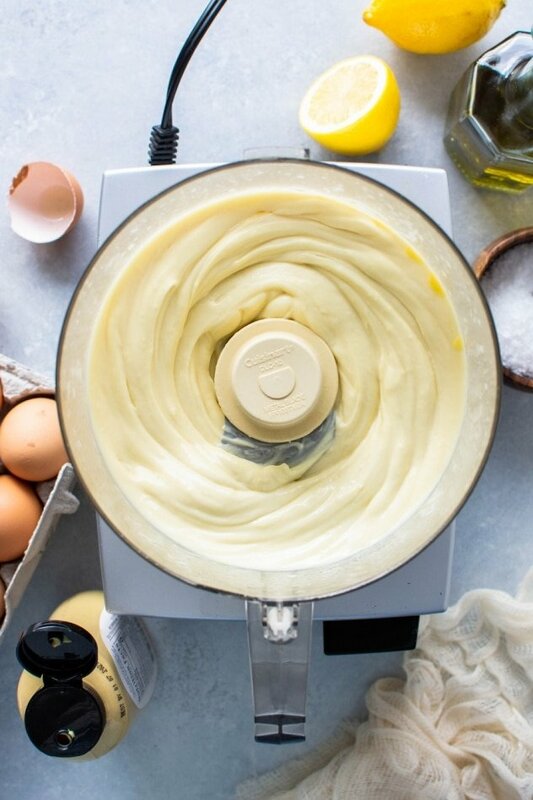 Add all ingredients to the blender and blend on high until smooth and creamy. 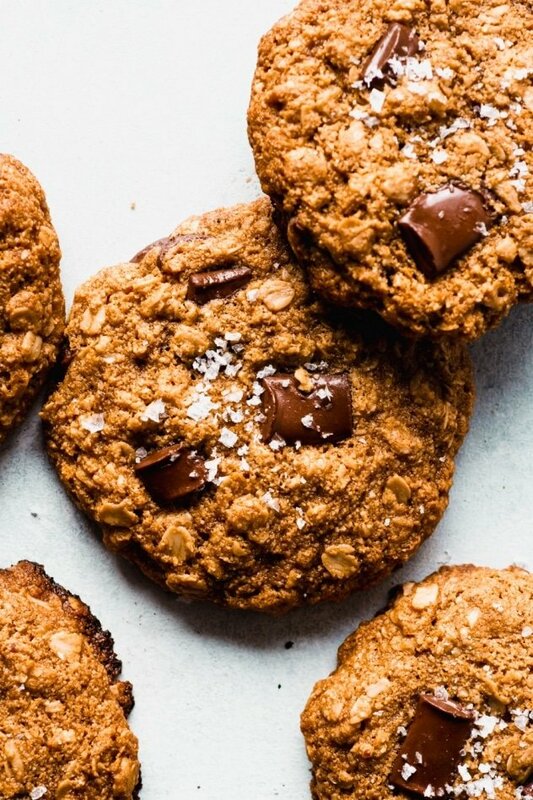 Taste and sweeten with a little bit of honey if necessary. 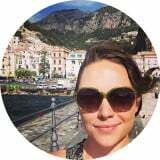 This entry was posted in breakfast, drinks and tagged easy, gluten free, healthy, mango, paleo, smoothie, turmeric, vegan, vegetarian, whole30 on September 21, 2018 by Nyssa Tanner.